Caretaker manager Colin McMenamin says he is prepared to serve the club in any capacity required. McMenamin took charge of Stenny for last Saturday's match at Dumbarton - their first since the shock departure of Brown Ferguson - and will be in the dugout again this weekend when Raith Rovers visit Ochilview. What happens after that is unclear as the club sifts through the application it has received for the manager's job. But with a battle to get away from the foot of the League One table and a tasty-looking Scottish Cup derby with Falkirk on the horizon, McMenamin says he is ready to serve the club in whatever role is required. He said: "I've spoken to the club plenty of times since it [Ferguson's departure] happened. "I'll do whatever it takes to help the club, whether that's now, next week or months after; I'm just here to do what's best for the club at the moment and am happy to play any role that's given to me." 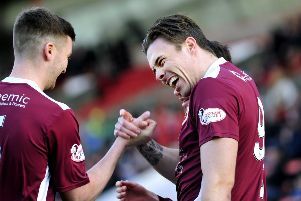 Despite a defeat at Dumbarton which sent Warriors back to the foot of the table, McMenamin felt his players acquitted themselves well in difficult circumstances. He said: "It's a difficult situation for everybody involved with the club but I thought the players were a credit to themselves and were unlucky not to take something from the game. "It's been very difficult but the players have got the momentum to move on from things now and take on the games that are coming up. "I was delighted with the performance on Saturday, I couldn't have asked for any more from the players. "For me they were the better team and created more chances and the better chances and at the end of the day we've been beaten by an absolute wonder strike. "The players did themselves proud, they did the past management proud and they certainly did me proud." Next up is the visit of a Raith Rovers side sitting second in the table. McMenamin said: "We know they're a very good team. We've already played against them at the start of the season at their place. "But we'll do our planning, have a look at them and see if we can come up with some sort of game plan to go up against them. "It's one of those leagues where everybody is much of a muchness. We haven't been outplayed by anybody yet. "If you've got the right game plan and the players work hard enough you are capable of beating anyone in this league. It's just a case of getting points as quickly as we can and start climbing the table again."